What kinds of technology will there be during the Tribulation? Bill Salus: I want to talk about the potential technology that surrounds the events that happen to the Two Witnesses. There will actually be two witnesses described in Revelation 11 who are preaching the Gospel to the world from Jerusalem during the Tribulation. Some people believe that they will be Moses and Elijah. We are not going to try to predict who they will be in this particular conversation, but they are preaching the Gospel and the Antichrist kills them and it says the whole world will see the deaths and actually rejoice. Concerning the Two Witnesses in Revelation 11, we are told in verse 7 that when they finish their testimony of teaching the Gospel in and around Jerusalem that the Beast who ascends out of the Bottomless Pit (that of course would be the Antichrist) will make war against them, overcome them, and kill them. Their dead bodies will lie in the street of the great city which is spiritually called Sodom and Egypt where also our Lord was crucified, which we know that would be Jerusalem. Then, those people from every tribe, tongue and nation will see the dead bodies lying there for three and a half days and not allow their corpses to be put into graves. Those who dwell on the earth will rejoice over them, make merry, and send gifts to one another because these two prophets tormented those who dwelled on the earth because they were giving the Good News versus the counterfeit gospel which are the lies of the Antichrist. We are talking here about prophecy that is deep into the mid-point of the Tribulation. So, the message of the Gospel is not received very well by whom? By the peoples, tribes, tongues and nations. In other words — the whole world. Now, Nathan, in the 1800's it was common held that the Bible had to be erroneous because there was no way during the 1800's that the whole world could see the two dead witnesses in Jerusalem for three and a half days. But, hasn't that changed now? Nathan Jones: Certainly! That story I could say cracks me up to a point. On one hand it is so sad that these Two Witnesses have such an important message that the entire world needs to hear, but are rejected. I mean really, how evil will the world have gotten that the entire planet has a party over their deaths and doesn't even have the decency of burying them? Then, on the other hand, the Lord in front of all of the celebrants in their face resurrects the Two Witnesses from the dead. It says the whole world gets to see them come back from the dead. You can imagine the people in Jerusalem who are standing around might get to see them. Maybe once they are up a mile or so in the air that the surrounding countryside sees them. But, how does an entire planet see this unless there is satellite television, and the Internet, and technological ways that can get pictures around? I'll bet YouTube will be posting videos of this all over their site. What a testimony that will be! Besides the three and a half years that they will be witnessing, they will also be resurrected from the dead. I'm sure the spin will go crazy trying to explain their disappearances. And yet, it will be a powerful sign during that time which I believe many people will come to know the Lord as their Savior by. And so, there must be technology used during that time. Bill Salus: Right. I would imagine that several of your mainstream news medias may still be around during that post-Rapture era. Maybe Fox News won't be here, but certainly MSNBC will. We don't know, right? I interpret the technological implications of this resurrection the same way, in that the whole world will then be able to see them. Whatever mainstream media is in operation at that time will certainly be covering that. For example, just think about when Desert Storm hit I believe around 1991 or so. I don't know about you, but I was watching every possible moment that I could of the events as Iraq was firing scud missiles into Israel and George Bush, Sr., was forming his coalition. Nathan Jones: Yes, I was watching the war with great interest because I was a senior in High School at the time. I was expecting that it could escalate and that I would be drafted into the military, and so I was really watching with interest. So, yes, the news media will most likely play a role in reporting the death and resurrection of the Two Witnesses. 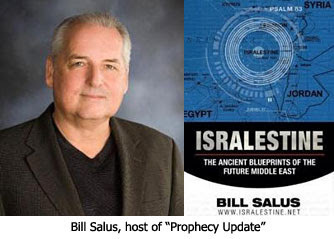 In the next segment of this interview with Bill Salus concerning Bible prophecy and technology, we'll look at the possible technology behind the Mark of the Beast. I reckon the pictures will be projected into the sky for all the world to see, even those with no tele in the middle of nowhere. Like Princess Leia did when she said 'Help me Obi-Wan Kenobi' - only up, and bigger?